In the process of knee replacement surgery, damaged bone and cartilage is resurfaced with metal and plastic components and pieces. When it comes to unicompartmental knee replacement—often referred to as partial knee replacement—only a portion of the knee is resurfaced. This surgical procedure is one alternative to total knee replacements for patients who may have problems with only a part of their knee. Thanks to a partial knee replacement being performed through a smaller incision, patients will spend less time recovering and return to their lives faster than those who have undergone a total knee replacement. Your doctor will discuss with you the options that will most effectively fix your specific and unique situation and symptoms. In knee osteoarthritis, the cartilage that protects the bones of the knee will slowly be worn away. This can occur all throughout the knee or just in a single location. Advanced cases of knee osteoarthritis that are limited to a single compartment may be treated with unicompartmental knee replacement. During this surgery, the damaged compartment is replaced with metal and plastic parts. The healthy cartilage and bone in the other areas of your knee, as well as ligaments, are preserved. You will be admitted into the hospital on the day of your surgery. The surgeon will also come visit you prior to surgery and sign your knee in order to verify where the surgery will take place. A standard partial knee replacement surgery usually takes about an hour. The surgeon will take a close look at the three compartments of your knee in order to verify that the cartilage damage is only limited to just one compartment. They are also verifying that your ligaments are still intact. If, after closer inspection, your surgeon feels as though the knee is not suitable for partial knee replacement, he may opt to perform a total knee replacement. This contingency plan will have been discussed with you in great detail well before the day of your surgery. Preparation of the bone—Your surgeon will utilize special saws in order to remove cartilage from the damaged compartment of the knee. Positioning of the metal implants—The removed cartilage and bone will be replaced with metal coverings that are intended to mimic the surface of your natural joint. These parts are held in pace with cement. Spacer insertion—A plastic insert will be positioned between two metal components in order to create a smooth gliding surface. Once your surgery has been completed, you will be taken to a recovery room where nurses will closely monitor your recovery from anesthesia. After this, you will be transported to your hospital room. Whether you believe it or not, the ultimate success of your surgery will depend upon how well you follow the instructions given to you by your doctor for when you are at home. You will have stitches or staples running down along your wound, or you will have a suture beneath your skin on the front of your knee. While some suture does not require any removal, staples will be removed a few weeks after surgery, once the doctor has confirmed you are healing properly. You must be sure to avoid soaking the wound in water until it has thoroughly sealed and dried. Continual bandaging of your wound will also be required. This may mean changing bandages several times a day at first. It is common for patients who have undergone knee replacement to experience a loss of appetite for a few weeks following the surgery. A balanced diet, sometimes supported with an iron supplement, is important in assisting your wound’s healing process and restoring muscular strength. Exercise is actually very important during the first few weeks after surgery when you are at home. In most cases, normal daily living activities can be resumed shortly after your procedure. Pain in and around your knee is common and will last for a few weeks to several months. 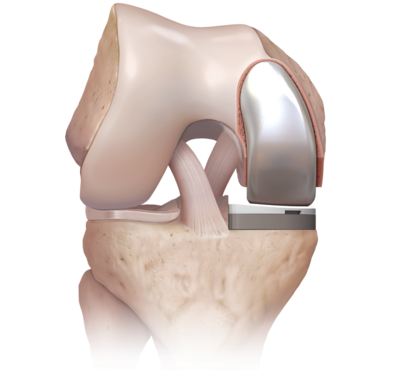 The end goal of any knee replacement is to improve the function of your knee. Though most people hope to return to normal after their surgery, full restoration of motion is not common. Most times, the motion you will have after your surgery can be accurately predicted based off the extent of motion you had prior to being operated on. Most people will be able to fully straighten their replaced knee and bend enough to climb stairs and enter/exit a car. Kneeling may feel uncomfortable, but is ultimately harmless. There are frequent reports of a feeling of numbness around the site of your incision. Some also complain of stiffness after bending their knee frequently. Another report from many patients after surgery is the feeling or sound of clicking in the knee, caused by the metal and plastic components moving about. This is normal. These small clicks and pops are due to the mechanic components and are more annoying than they are painful or restrictive. 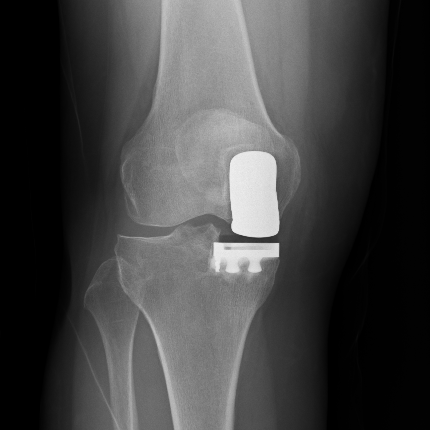 It is important to note that your new knee may activate metal detectors at airports and other places. Be sure to alert security of this before the alarm is activated. It is also recommended that you take oral antibiotics prior to any future dental appointments to significantly reduce the risk of infection.